You’ll never need to buy hummus again with this recipe. It’s so easy and so quick to make and just as tasty. 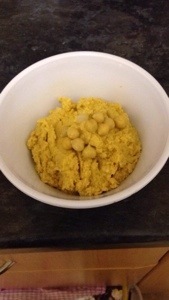 -Put the chickpeas, lemon juice, cumin, tahini (if you have it), garlic and water in to a food processor and blend until smooth – or if you’re a fan of chunky hummus just blend until your desired texture. -Smooth out with a back of a spoon and drizzle with oil and finish by decorating with the remaining chickpeas and a sprinkle of paprika.